Disclaimer: Only you – as the reader – can decide what is best for you. ANONYMOUS stands for freedom of speech, freedom of choice, and the freedom to report on topics of individual discretion. One particular party, The Humanity Party, if voted into power, has vowed to end all citizen rights to own a gun. An amendment of the U.S. constitution would reflect this sweeping change; the citizen would be governed by an all-encompassing police and militia, ruled only by the president. Why, you ask? Why America? Because, according to their FAQ sheet, America is the only nation that “has the power to establish laws that mandate price controls” and moderate human rights laws of other nations from which they consume goods and services. Ideology is considered dangerous. Science is considered problematic, systemic to our greed and selfishness. In the proposed constitution, under Section 9e – Powers of Congress, copyright law would only be extended to “useful Arts” not specified; but that is the smallest detail of a much larger plan. American states, according to the proposed constitution changes under Section 1a – The Legislature, would see state sovereignty abolished in favor of Federal governing. Instead, 50 “Divisions” would replace states – with similar boundaries and state names remaining the same unless citizens decided otherwise. In essence, the name ‘State’ would change to ‘Division’, and all state laws and rights would disappear. There is also the troubling “consensus of unanimity,” where Congress would struggle to pass any law; encouraging further back-door deals. A unanimous ruling is great in theory, but is a majority rule so bad? However, on the bright side, according to Section 2e – Powers of the President; of Foreign Policy, if six months were to pass without Congressional agreement on temporary laws introduced by the president, the policy in question becomes automatic law. On the plus side, the president would never receive a pension for their public service, and their wage is capped at twice the amount of Congress members. The president must also provide transparent reports to the people, too. However, the right is reserved for secrecy if the material is deemed to be of a sensitive nature. Does it matter that ALL citizens who aren’t Militia, police or Congress approved will lose their rights to bear arms? What about state sovereignty? We don’t need that either, or do we? You can see the enlightened approach to this. If citizens’ don’t have firearms, then there would be less violence, right? This is the argument for the amendment – the same argument we’re having today. There is no simple answer. According to the proposed constitution (Section 5 – Right to Bear Arms) “No person shall have the right to bear arms.” It is “strictly prohibited,” except for the Militia and law enforcement. Who is this Political Party? In 2005, they evolved into Widow’s Mite Foundation, then into the Worldwide United Foundation, and eventually the Humanity Party®. 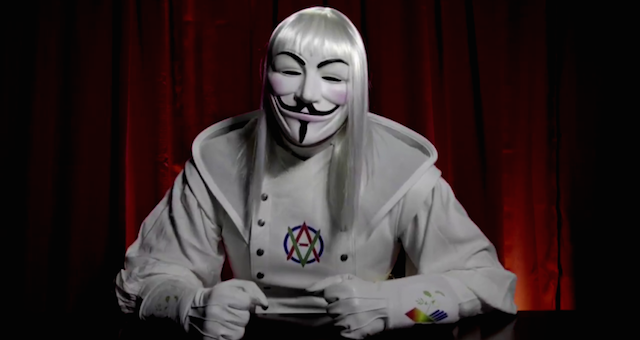 Donning a Masonic like uniform with a Masonic type emblem on their latest YouTube clip, they also go under the banner Anonymous. You Say What? Anonymous? Get Out of Here! According to Nemelka, Anons who have said otherwise on the Internet now face lawsuits for expressing their opinion slander. “Exposed what? Lies? Misinformation? Gossip and conspiracy? Nothing they have exposed is truth. We are preparing a Federal Law suit to legally counter their defamation and slander,” he states. One wonders if he believes the Humanity Party’s proposed constitution has been enacted. Section 6 – Right to Personal Information Privacy dictates that the media and others cannot publish any personal information anywhere, without the express permission of the subject in question. “What is needed is for the ninety-nine to appoint one to represent them, who becomes the “Anointed One” and possesses the power and knowledge to represent all equally. This chosen one must possess the gentle nature of a lamb to assure equality and fairness to all, even to the 1%, but brandish a sword from which none are immune from the strength of its blow. This “Anointed One” is truth and justice for all equally. This “Anointed One” is the Humanity Party®. Doesn’t sound very Anonymous to me. But what would I know? I’m just another dumb Anon…are you? All sources come from the Humanity Party (Anonymous) blog, webpage, Proposed Constitution, FAQS, etc. Originally this article was published under my pseudo You have permission to republish this article under a Creative Commons license with attribution to the author AnonWatcher and AnonHQ.com. Excellent article, as usual. Scary, too, o’course. And since writing this article, the man responsible for creating the Humanity Party – so I’ve discovered with a little help ;), was also the same man responsible for cult-like activities with “Worldwide United Foundation”. Even carrying a similar logo to the one he used with the Humanity Party. Some scary stuff, indeed. If I lived among a totally righteous people.. and I myself was righteous in all my ways.. That is .. If all people did unto others as they would have others do unto themselves… Then, this order of things might work. Christ is our Head and the Church the Body. What? Does not the Head remain? Is the Head cut off? No, the Head remains the Head and there is no other and the Body agrees because the Head is Righteous and what wise Body would not follow It’s Righteous Head especially if the Body be Righteous also? That would be like unto the government of Zion in that sense. The pure of heart will follow the Head, need no guns, have one ideology all being like minded, cover the earth as prophesied, ect. ect. ect.